HYANNIS PORT - For three generations, the Kennedy family has spent countless hours here tossing footballs on the beach, sailing near their collection of cottages, and producing iconic photos fit for Life magazine. They have mourned losses of loved ones in the most public fashion, and they have celebrated marriages, births, and political victories. But the death of Senator Edward M. Kennedy, who for decades has been the glue that held the family together, closes a chapter of a storybook Camelot tale that has flourished at the end of Marchant Avenue. 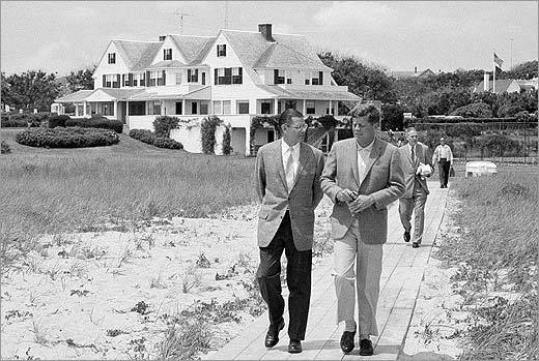 Much of the Kennedy compound will probably be turned over to a national nonprofit group, possibly to be opened up as a museum or retreat center. The property, long seen as a holy site of Democratic politics, is located in a small village that has captivating views of Nantucket Sound. It is a place where bikes lie in front yards, where bougainvillea and rose bushes flutter against white picket fences, where the ocean breeze carries a salty mist. It is where political campaigns and raceboat victories were hatched, where Senator Kennedy tossed tennis balls to his Portuguese water dogs, Sonny and Splash, where he set sail on his wooden schooner, Mya. Joseph P. Kennedy began renting the house, with its wide veranda and ocean views, in 1926. He bought it three years later and enlarged it to fit the large family. Two of his sons, John and Robert, purchased their own homes next door when they got older, and for 80 years the rambling white houses by the sea have been the scene of numerous moments fit for the history books. The family gathered here to grieve on Thanksgiving Day in 1963, days after President Kennedy was assassinated. Senator Kennedy returned to the compound in 1969 after the funeral of Mary Jo Kopechne, emotionally shattered and prepared to resign his Senate seat and give up politics. It was during a walk on the beach that his most trusted aide, David Burke, persuaded him to remain in the Senate and try to put the Chappaquiddick incident behind him. When John F. Kennedy Jr.’s plane crashed into the ocean off Martha’s Vineyard, three priests celebrated Mass under a white tent that had been installed on the lawn for the wedding of Bobby Kennedy’s youngest child, Rory. It was Senator Kennedy who held a chalice of Communion wine while one of the priests distributed Eucharistic wafers. “You would go to the house to drop him off, and he would be in this big rambling home, essentially by himself,’’ said one former Kennedy aide. “There were all these pictures on the walls of his dead relatives, who died too early. Because of all that history, the place is half museum and half home. In the living room, there is a couch where Rose installed a plaque to note that Cardinal Eugenio Pacelli once sat on it; he later became Pope Pius XII. Every year at Thanksgiving - rain or shine, warm or cold - the family goes out to sail. A group of close family friends is invited over for a meal, often accompanied by a Christmas singalong. Every year, tourists make the pilgrimage to Hyannis, hoping for a glimpse of the Kennedys, a taste of their way of life. They sail into the harbor for a better look at the home. They stop by St. Francis Xavier Church and view the pew where a plaque marks where the president sat for Mass, at the end of the row, if a quick getaway was needed. Before the stockade fence went up years ago, people would rip shingles off the sides of the houses. Visitors would grab dirt and grass. But with the death of the last son of Rose and Joe Kennedy, a piece of that dynasty ends. Ethel Kennedy, the wife of the late Robert F. Kennedy, still lives in a home on the compound. Governor Arnold Schwarzenegger of California and his wife, Maria Shriver, own a home about a block away, as does her brother Robert. But without Teddy - the freckle-faced little brother who became the patriarch known as the Grand Fromage (French for “the big cheese’’) - something will be missing.